Li Lan, a young Chinese woman in Malaysia, has few marriage prospects. Since her mother died, she has been raised by her amah (nanny) and her opium-addict father has been largely absent. There has been no one to arrange a marriage for Li Lan, although she has entertained dreams of a new, modern love match. Understandably, Li Lan is shocked when her father tells her the Lim family has approached him about making her a “ghost bride” to their dead son. She would be married to the dead son and then live her life in the Lim household as a widow, without ever getting to be a wife. When, on a preliminary visit to the Lim house, Li Lan meets a handsome servant man, I thought, “I know where this is going.” Turns out I underestimated the author. Yangsze Choo has written a novel that rises above the usual tales of unhappily arranged marriage and ill-fated love matches. 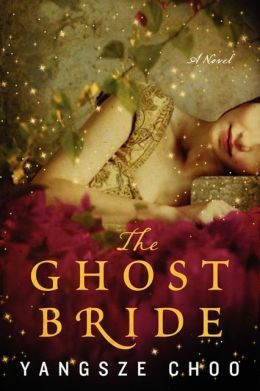 Li Lan journeys to the spirit world, where she discovers that her marriage prospects are far more complicated than she ever imagined. I have read more than a few novels set in Chinese culture, not only past and present but also largely fictional. This is one of the best. The writing reminded me of the late, great Pearl S. Buck. Was it the vivid descriptions of sights, smells and tastes in both this world and the next? Was it the carefully drawn unspooling of intrigue involving players living and dead alive? Was it the character of Li Lan herself on her inner journey from naivete to choosing love? Maybe it was all of that; regardless, I’m a fan. This entry was posted in Fiction and tagged book review, china, dragons, fiction, ghost, love. Bookmark the permalink.